Hello everyone, CEO Olivia here. If you’ve seen enough pictures of Suzie Q & myself, you’ve probably noticed we wear a harness instead of collars. Today I want to bark about why. 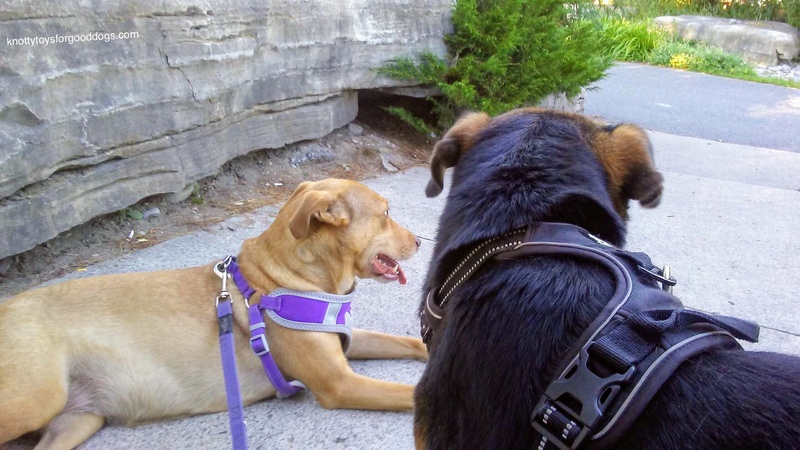 Let’s start by saying we here at Knotty Toys for Good Dogs have a bias in favor of using a dog harness instead of a collar for walking your dog. I believe it’s a safer choice. A collar can be a great accessory, good to keep ID tags on or in the case of a training collar (often referred to as a choke collar; if you are choking your dog, you are not using it properly. Get the advise of a professional when using a training collar) if used properly they’re a great tool for getting your dog’s attention. However, a collar can put a great deal of pressure on a dogs throat & could cause serious injury to the trachea & the thyroid gland, which is located in the front of the neck. If a leashed dog in a collar suddenly lunges at a squirrel while on a walk, it could injure itself. Smaller dogs such as toy poodles or chihuahuas, are delicate & dogs with short muzzles, such a pugs will benefit from a harnesses instead of a collar because of their unfortunate predisposition to breathing complications. There are two general designs of dog harnesses, those that are front attaching & those that are back attaching. For larger dogs, we suggest a front attaching harness. This type of harness attaches in the front of the dog between the legs & can offer more control as it gently tightens when the dog pulls & guides from the front. For smaller dogs, we suggest a back attaching harness that clips onto a leash just behind the shoulders. A dog collar is obviously cheaper & easier to use. Most people put one on their dog & leave it. A harness should be used for walks but removed when at home. So it may take an extra few minutes & effort but we feel a harness is a much safer alternative. Personally, I find it very comfortable too. Collars vs. Harnesses: Which is the Best for my Dog? The boys both wear harnesses any time they are on their leashes. Both are pullers and would cause damage if we attached a leash to their collars. This is great information. Thanks for sharing! We dogs always appreciate when our humans put our personal needs, safety & health first.